After a long day on the mountain, a hearty meal is more than necessary. 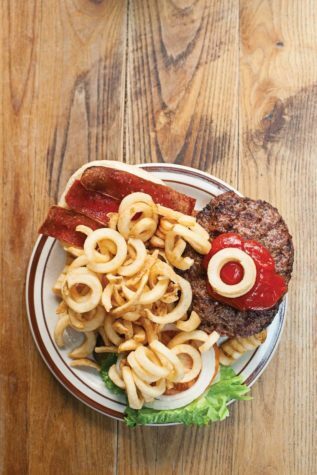 Nothing does the job better than a burger, and the Sugarloaf area has plenty of good ones. There’s no question that bacon makes everything better, and the strips on this burger are maple-candied. With a potato bun and onion jam made from Geary’s Hampshire Special Ale, this burger is as unique as it is tasty. Imagine a typical cheeseburger, but instead of two buns the burger is sandwiched between two fried macaroni-and- cheese patties. Add bacon and house-smoked barbecue sauce, and you have the Mac ’n’ Stack. To take a burger from good to Gucci, you need only one thing: pepperoni. This classic burger, which also has all the regular fixings of the restaurant’s famous Bag Burger, is stacked with it. Nothing ups the ante like good cheese. Served on a baked brioche bun, this burger’s local grass-fed beef is topped with delicious smoked gouda. Even for omnivores on the mountain, this flavor-packed vegetarian option doesn’t disappoint. The burger includes a marinated portabella mushroom, a black bean and spinach patty, baby greens, and roasted peppers. This Angus burger will certainly warm you up after a chilly day on the slopes. Not only is it topped with jalapeños, green chiles, and Pepper Jack cheese, but the beef patty is infused with hot sauce.